ICANN’s new generic top level domain process failed the gay community. Some of the new gTLDs that are in play. This week, the long-delayed decision from the Internet Corporation for Assigned Names and Numbers on the future of the new .gay generic top level domain (gTLD) was published, and the news was very bad for the LGBTQ community. ICANN is the entity that controls the key bits of the Internet, in particular the domain name system. It is currently in the long drawn-out process of creating hundreds of new gTLDs, including .lawyer, .ibm and .hiv to join stalwarts such as .com and .org. I’ve written about this process a few times in Slate, often about the application for the .gay domain name (here and here), which has been subject to a fight between three commercial applicants and a fourth, dotgay LLC, which was applying under the “community priority evaluation” process set up by ICANN to protect certain domain names that served the interests of a particular community. In a document dated Oct. 6 but made public on Thursday, that application was rejected following a review by the Economist Intelligence Unit, the business contracted by ICANN to carry out this task. As I’ve written, the process has been confusing at best, scandalous at worst, with ICANN making up rules as it goes along and clearly not really understanding what it thinks a “community” must be. The benefits for a successful community priority evaluation for dotgay LLC would have been huge: It would have automatically been awarded the name. This would have offered real protection against abuse: dotgay LLC planned to guarantee that those buying a .gay domain would have a real connection to the LGBTQ community, thanks to the use of “authenticating partners,” recognized organizations that would vouch for the reality of this connection. For example, the International Gay and Lesbian Travel Association would be entrusted with authenticating applicants from the travel industry. Why was the dotgay LLC application rejected? The EIU used a 16-point scale. To achieve community priority status, a score of 14 was required, a high bar. The review is public, so we can see that dotgay LLC scored 10 out of 16, far lower than anyone expected and for reasons that show just how broken this ICANN process is. As the application itself also indicates, the group of self-identified gay individuals globally is estimated to be 1.2% of the world population (more than 70 million), while the application states that the size of the community it has defined, based on membership with APs [Authenticating Partners], is 7 million. This difference is substantial and is indicative of the degree to which the applied-for string substantially over-reaches beyond the community defined by the application. ICANN understands community in a very narrow sense: You have to be able to count everyone in the community you aim to serve. The administrative community defined by dotgay LLC is by its very nature much smaller than the LGBTQ community as it’s generally understood by most people, a community whose size is truly unknown, with that 7 million being only the roughest of estimates, and much smaller than the possible community if allies are included. In any case, by applying an authentication process as required by ICANN, there is an automatic gap between the number of possible websites created and the much larger number of potential interested parties. EIU has taken an almost perversely narrow interpretation of how the broader LGBTQ community would relate to the users of the .gay domain. In the system understood by EIU, only a community with literal card-carrying members can exist, an understanding that by definition excludes LGTBQ people and organizations. Included in the application’s community definition are transgender and intersex individuals as well as “allies” (understood as heterosexual individuals supportive of the missions of the organizations that comprise the defined community). However, “gay” does not identify these individuals. Transgender people may identify as straight or gay, since gender identity and sexual orientation are not necessarily linked. Likewise, intersex individuals are defined by having been born with atypical sexual reproductive anatomy; such individuals are not necessarily “gay.” Finally, allies, given the assumption that they are heterosexual supporters of LGBTQIA issues, are not identified by “gay” at all. Thanks, EIU, for this lovely bit of straightsplaining to tell LGBTQ people who they are, despite the lengthy presentation by dotgay LLC in its various filings on why the stable and historic term “gay” was chosen to represent a diverse community. Another area where dotgay LLC lost points was in community support. EIU recognizes the legitimacy of the support of the International Lesbian and Gay Association, but says it’s not enough, because while ILGA is a legitimate representative of the LGBGQ community, it has not been officially designated by the gay community to represent it. (Apparently, we all missed the worldwide “vote pink” day.) This objection is all the more perplexing since despite a mandate to become more democratic, ICANN itself has refused proposed democraticizing measures such as at-large members. Hypocrisy aside, ILGA, a U.N. Economic and Social Council member, was not alone in supporting dotgay LLC’s application: Hundreds of other organizations from all sectors of LGBTQ life were also behind it. Nonetheless, one point docked. A final point was lost because of “community opposition.” There was just one official objection received, and it was rejected, but that was enough to cost a full point. The objection concerned authentication, a principle required by ICANN. So, ICANN requires authentication, someone complains about authentication, and that is grounds for a negative review by ICANN. Whether the objection is legitimate or not, EIU says that the very existence of an objection makes it “relevant,” thus costing a point. This is a perfect example of how this improvised process has failed, of how ICANN is broken: In an evaluation where three points are the difference between success and failure, the fact that someone objects is enough to lose a full point. In failing dotgay LLC, ICANN may be adding fuel to the fire of European opposition to U.S.-designated ICANN, just as the Department of Commerce is preparing to give ICANN full autonomy over the Web. The issues go beyond the brand-protection issues of .wine/.vin, and concern human-rights protections. And indeed, the new .gay gTLD was cited as the very example of the need to protect communities in the Council of Europe’s report on “ICANN’s procedures and policies in the light of human rights, fundamental freedoms and democratic values.” Will European governments now use the rejection of community priority for dotgay LLC as part of their case against granting it authority over the Internet? It may be the last hope for saving a community-based .gay. 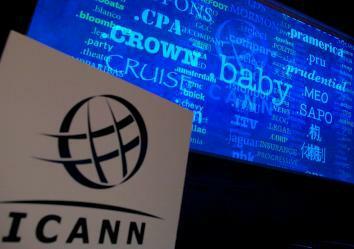 Certainly, ICANN has shown itself deaf to nonfinancial interests. In the release that announced the failure of dotgay LLC, ICANN said that .hotel would be an approved community domain name. Hotels are a community, gays aren’t. There’s something wrong with a system that gives such crazy results. Those who are disappointed are showing it in an online campaign using the hashtag #ICANNisBroken aimed at the @ICANN social media accounts. ICANN is holding its 51st world meeting in Los Angeles next week, and dotgay LLC will be there. Tallying points on a silly scorecard is easy. ICANN may find it rather more difficult to look LGBTQ people in the eye and tell them that gays are less worthy of recognition than hotels.